Today in my series of interviews with sewing bloggers on their connection between sewing & style, I’m delighted to feature Jessica of Running With Scissors. I’ve been reading her blog for quite a while and was delighted to meet her at Sewing Summit where I learned that she’s just as friendly, creative, funny, and engaging in real life as she is online. I am thrilled to share my perspective on sewing and style! I met Erin at Sewing Summit. I sat next to her at a lunch and she mentioned she is taller than her fiance and I was almost hopping out of my seat and flapping my arms with excitement because I am also taller than my husband. It’s so fun to meet another non-traditional heighted couple. We had an instant connection with our men and both being tall women in general…which leads right into why I sew my own clothes! What inspires or influences your style? The main motivation for me to begin sewing my own clothing was largely due to my body. I am pretty tall, almost 6′, but have ridiculous proportions. My torso is midget sized with my bottom ribs sitting only 1″ above the top of my hip bones, meaning no waist. 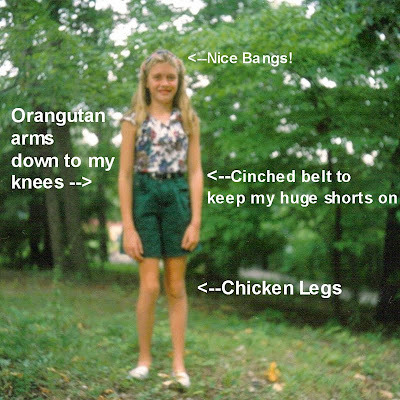 Then my arms are like an orangutan–you know the test to see if your shorts are too short in grade school? My fingers can touch my knees almost so I pretty much couldn’t wear shorts to school. Then my thighs are too long so even buying tall-sized jeans with a 36″ inseam puts the knee of the pants right where my thigh gets wide so basically, clothes just can’t be purchased and fit correctly. I’ve never purchased a long sleeve anything where the sleeves were ever long enough. There are those tricks like washing the tee shirt and stretching the sleeves while wet to air dry, but you can’t really do that with a wool pea coat. 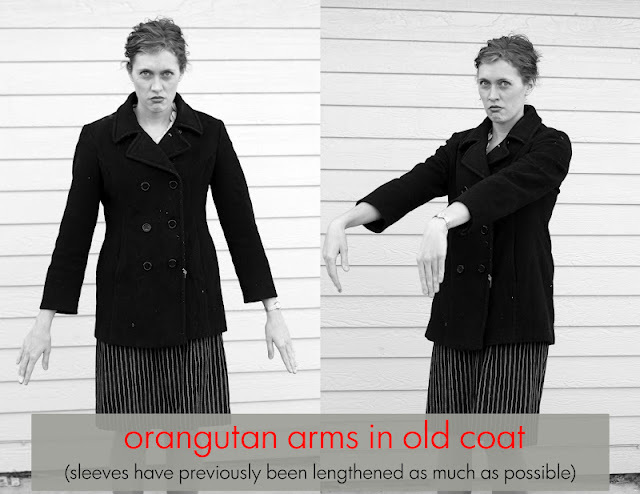 Thus, us tall, long armed women end up with Frankenstein coats. So I learned to sew in order for clothes to actually cover my body, and in the process I get to be creative with whatever I’m making to suit my taste and style…and always make sure they have really long sleeves. I don’t really have an overall phrase to describe my style. Maybe because I’m closer in size to average men than women or the fact I love war movies I’m really inspired by military uniforms and structured garments. I actually love menswear and try to mix some manly style into my own wardrobe here and there. 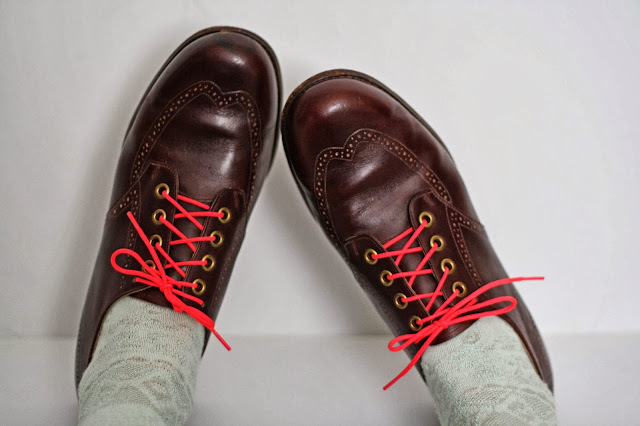 I’m not a cross dresser, it’s also important as a huge female to feel feminine, but as an example I have been loving the man trend of wearing neon dress laces with brogues. I’m more inspired by the uniforms in the 1980s Star Trek films than the Oscars red carpet gowns or a fashion magazine. I’m also really inspired by historical clothing and love the challenge of taking elements or a silhouette and using them in a modern way. I love structured, tailored pieces and those are definitely my favorite pieces I’ve created for myself. I focus a lot on textures and a lot of my designs start from the texture of the fabric or the texture the technique or fabric manipulation will provide. Because there are certain garments I’ll never be able to purchase, much of what I get to sew for myself has landed in the outerwear or sportswear area in coats and blazers. I’ve made a little of everything from bathing suits to my own jeans and trousers. Dresses are also easy and fun, but for me structured, tailored pieces are a challenge and a good excuse to sew with my favorite fabric, wool! I don’t hate prints, but don’t often sew with them. My usual every day wardrobe stinks. I have three small children and so by 9 pm most of my clothes are gross and sticky. So I stick to jeans and tees most of the time. But when I actually plan an outfit, I try to pick one stand out element, and keep the rest kind of quiet. I can be kind of shy, so I don’t want to jump out of the crowd in a head to toe show stopper, but if you stop and look at me, you might notice one really awesome piece you couldn’t find in stores. I guess I’m not ready to look totally awesome, just subtly awesome if you took the time to notice it. In most pieces, it enables me to actually wear something that fits, so it’s crucial and making my own clothing. 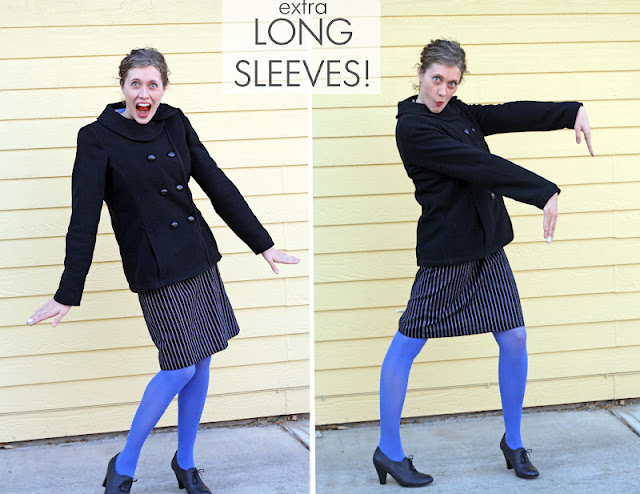 It allows me to enjoy simple things most women probably take for granted, like a coat with sleeves that actually hit your wrist bone. But it also hinders what I can wear, because I feel like so much needs to be handmade, or I get used to getting exactly what I want and I’m not about to spend money when I know I could create something I prefer. Overall, I think sewing opens a creative field of possibility in what I can wear because I can create it rather than just curate someone else’s designs from stores. Does your passion for sewing influence the style of those around you? I don’t think my style make an impact on any other adults. I live in a tiny town in the middle of an isolated desert and (I actually love) there are no fashion contests really. Maybe big hair contests, but for the most part I feel we are all down to earth and just independently wear what we like. But you bet my kids are influenced as I also sew much of their clothing and my toddler had a wool blazer that she didn’t really need, but it was really cute! 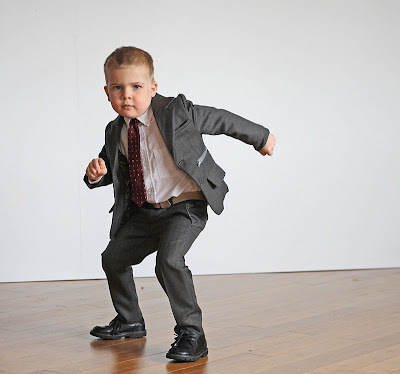 Or my son’s 1950s James Bond inspired suit with spider print lining. Some of my favorite pieces I’ve sewn have been collaborations of my own style and designs with their 4 year old preferences. Has your style changed with time? I think the older I get, the more confident I get in being who I want to be. I’ve had a secret little passion for military elements since I was a kid and in high school had a button down white shirt that had epaulets. I made little red bands to button on them and got comments about looking like a boy scout and never wore them again, but I loved them! I wish I’d just loved my style and owned it more as a teenager rather than just wearing solid colored Target tees and jeans my whole life. Pretty boring. So I guess as I get more comfortable I am more willing to wear exactly what I want despite people thinking I’m weird wearing men’s shoes with neon pink laces. In all realms of life– the minute I stopped caring about what anyone else thought, is the same minute I started being exactly who I want to be and find I’m much happier. Does your style require that you are able to sew? More and more as I improve my sewing abilities, I also do more of my own designing and that requires me to sew. I guess to get unique clothing I love, I have to sew it because I’m a control freak in order to get the fabric, fit, and design exactly how I want it. I think the relationship with improving my sewing abilities only frees my style as I can sew things I’d always wanted. The first wool coat I sewed rocked my world and opened new opportunities for wearing clothing that not only had my personal design elements, but actually fit! clicked over her from Jessica’s blog. while I really like just about everything I have seen (those she has shared) I think when she shared her “sheet dress” I have been a fan since. I do not recall having noticed the finish on the blue dress with the green lining that peeks at the hemline and have all sorts of things rolling about in my own mind. Perhaps being a tall woman with the lack of a waist and wondering why the fashion industry thinks because I am tall I naturally have a need for pants that have crotch that falls halfway down my thigh, perhaps all of these things lead me to find an understanding soul in Jessica. SORRY about that rambling sentence. Besides all that she shares lovely trendsetting ideas for sewing for children with such lovely models. And that she and her husband are so in love with each other and their children seals it all.Thanks for this spot featuring her. I’ve followed Jessica for a while and enjoy her very much! I really felt a sense of kinship with her when I read about her long thighs. I am her height and feel that my thighs are the main reason I’m so tall. When I sit in a school bus, my knees press the seat in front! Ugh! For years I sewed for myself in order to get things to fit, but got away from it as I got older and busier. I made do with the tallest things I could find. Now I’m recently retired and am looking forward to getting back to sewing for me. You and Jessica inspire me and I hope to follow you also from now on! Thanks for this interview! So glad that we could both be sources of inspiration! I feel ya on bumping knees when sitting on the schoolbus! I love Jessica’s blog, and this is a great post to learn a bit more about the behind the scenes of her sewing projects. Favourite quote: “I’m not ready to look totally awesome, just subtly awesome if you took the time to notice it.” I think that’s a pretty neat philosophy for fashion in general. BTW, Jessica, I think a lot of your clothes are totally awesome. 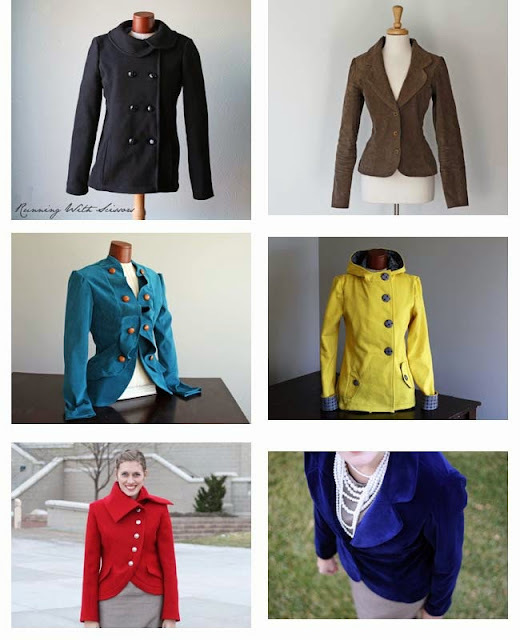 The yellow hoodie and ruffled equestrian jacket have been on my pinterest inspiration boards for a looooong time. Plus RJ’s wardrobe is pretty fabulous. I also loved that quote! oh I simply love Jessica’s style. her posts are always refreshing and different. and i wanted to just say: I came over from Jessica’s site and my first thought was that your blog design is really beautiful. love it! Loved reading this. Jessica is so talented!! !